In these classes parents are encouraged to participate and be 'hands on' in teaching the child the fundamentals of water safety and water familiarisation. These classes are great for building confidence in the water and are an extremely fun activity for the baby and parent. The songs and activities will keep everyone smiling! Water proficiency and basic swimming techniques are taught at beginner levels. 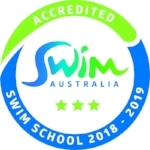 We emphasise 'getting things right' from the start to ensure correct technique as the swimmer advances through learning the major strokes. Water safety is paramount and is presented in a fun yet structured manner. Once general water safety requirements are met, further emphasis is then placed on technique. Kicking, streamlining, Freestyle, Breaststroke, Backstroke and Butterfly techniques are all taught to the children. New Wave Swim School is the place to take your swimming to the next level. Our coaches are leaders in their profession and will have you swimming faster than ever. We run squad training sessions at Toorak College in Terms 1 and 4. The squad program is overseen and coached by Olympian Andrew Lauterstein.